Czy kody kreskowe UPC-A i EAN-13 są takie same? 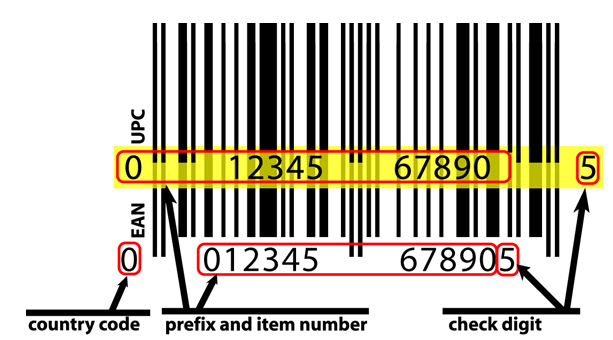 Before you buy a barcode, we have written this tutorial to help you understand the differences between UPC Barcodes and EAN Barcodes. Below are both an EAN barcode and a UPC Barcode. The EAN contains a 13 digit number and the UPC contains a 12 digit number. Taking this a step further, we have overlaid the UPC and the EAN graphics (symbologies) so you can see that the graphic is identical. The country code doesn’t appear beneath the barcode in a UPC since the GS1 didn’t grasp the importance of US and Canada indicating country codes. They felt that since the majority of products sold in both countries originate from importers, distributors or manufacturers in the USorCanada, they could forego the leading zero in the human readable numbers. With the acceptance of the EAN in Europe it was understood that the U.P.C. was actually 13 digits because the parity pattern of the left half of all odd characters was assigned the value (or country flag) of “0”. I pointed out that the UCC only printed 11 of the 13 digits and carried only 10 digits in the system. The UCC continued the delusion by using the foolish argument that “0” means nothing and therefore could be ignored. On the other hand, the European’s were smart enough from the very outset to call the EAN symbol what it is, “EAN-13” and they printed all 13 characters. Systems in Europe carried all 10 country flags including 0 in their records and their systems could process both U.P.C. and EAN symbols and/or numbers. The U.S. groceries chains at the time were selling very few foreign goods and saw no reason to spend money modify their installed equipment. Although the U.P.C. was not widely accepted at that time, the UCC accommodated the foreign companies by issuing them U.P.C. numbers with the invisible country flag of “0”. Because there are more than 9 countries, the country flags have been further subdivided by using the next two digits for various uses and countries. The United States and Canada have the country flag 0 and subdivisions 000 thru 139. It is interesting to note that the publishing industry produces so many products that it is its own country called “Bookland” for number assignment purposes. Bookland has been given two subdivisions of the country flag 9. They are 978 and 979.